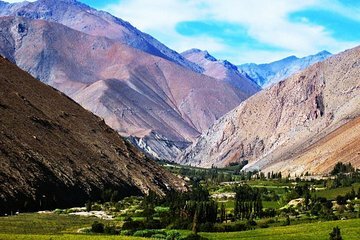 Visit the home of Chile’s famous Pisco Sour on this full-day, small-group tour of the Elqui Valley from La Serena, including hotel pickup. Uncover the cosmic secrets of the Cochiguaz Valley; tour a Pisco production plant; and indulge in an expert-led Pisco tasting. After tucking into a traditional lunch (included) at a local restaurant, spend time exploring Vicuña, the hometown of Nobel Prize winning poet Gabriela Mistral. Very interesting tour. Both the tour guide and driver were very helpful and knowledgeable. Our group included English and Spanish speakers and our guide had no trouble going from one language to the other so everyone knew what was happening or what the information was. Very relaxed pace. Beautiful Elqui Valley. Tour pretty mediocre. Passeio sensacional! Vistas deslumbrantes e um guia muito atencioso e bem informado. Dicas de roupas e sapatos confortáveis foi essencial. Recomendo! !